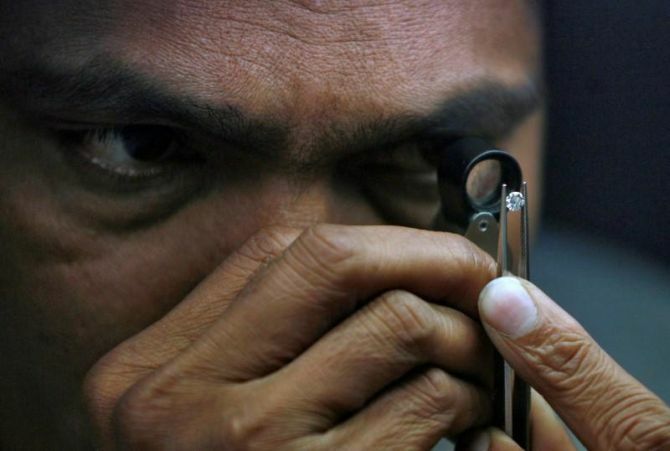 The fragmented and largely unorganised diamond polishing and trading industry would shortly organise itself at a single location, with Surat set to get an international diamond exchange in three years. After a delay of two years, Surat Diamond Bourse (SDB) has awarded the contract to PSP Projects. Construction work begins this week, to be completed in 36 months, say the bourse’s committee members. It will be part of the 2,000-acre Surat Dream City, being equipped with smart city features on the lines of the Gujarat International Finance Tec-City (GIFT City) near Gandhinagar. SDB is being set up as an independent international exchange on the lines of existing bourses in the segment in New York, Antwerp, Hong Kong and Dubai. “Security is the top priority and high-end technology will be adopted. For instance, face recognition and related technology will be adopted to restrict direct entry for non-members. Visitors will have to go through strict security protocol, with continuous monitoring,” said Dinesh Navadia, committee member and regional chairman of the Gems & Jewellery Export Promotion Council (GJEPC). The diamond bourse at Dubai is five million sq ft and in New York it is at 4.5 mn sq ft.
SDB will have 6.6 mn sq ft, making it the largest, Navadia claimed. Currently, the only existing international one in India, the Bharat Diamond Bourse (BDB) in Mumbai, has a total constructed area of two mn sq ft. Its nine connected towers have 250 offices. After, SDB will house 11 connected towers of 11 storeys each; it is to accommodate a little over 12,000 merchants through offices of various sizes. After former Gujarat chief minister Anandiben Patel had laid its foundation stone, along with the Surat Dream City, SDB had seen delays in terms of height approvals. After sanctioning of an international airport there, the Airports Authority of India (AAI) had issued a notification reducing the permitted height. “We saw some delay in getting final height approval, after which the real work on the bourse began. It will be completed at a project cost of Rs 2,400 crore (Rs 24 billion), of which Rs 1,500 crore (Rs 15 billion) is the construction cost,” Navadia added. Till now, 4,250 members have signed for small and large offices at the bourse. In sum, India will then have two global diamond bourses. Veterans explain that the country handles Rs 1 lakh crore worth of rough diamonds a year, with Rs 1.5 lakh crore of polished diamond exports. “The US has two-three such bourses. India, being the largest market, especially in polishing, needs more than one. The industry in Surat is fragmented into four-five business centres in various areas. These need to be consolidated and brought to a single place,” said Praveenshankar Pandya, chairman of the GJEPC. Unlike some diamantaires in Surat, who said that almost 70 per cent of business could move from Mumbai’s BDB to Surat’s SDB, the former’s president, Anoop Mehta, said each would complement the other. “Mumbai has historically been a trading hub, with multiple international flights, unlike Surat. Efficiency-wise in trading, Mumbai will always continue to maintain its hold. However, the smaller traders and cutters in Surat need to be organised. Plus, the manufacturing strength of Surat will complement the trading strength of Mumbai. SDB will do that, acting as a feeder to BDB,” Mehta told Business Standard. Having awarded a construction contract, the SDB committee will soon begin work on giving the information technology infrastructure contracts. SDB aside, Surat Dream City (15 mn sq ft, to cost Rs 1.25 lakh crore) will house international banking and insurance facilities, world-class security surveillance, a dedicated customs house, freight forwarding and consolidation facilities, connecting corridors to the airport and highways, integrated ‘smart’ residential housing projects, entertainment and recreation facilities, hospitals and a sports complex, on the lines of GIFT City’s features. It will be built as a Wi-Fi enabled smart city, with committed power supply, drinking water and drainage systems, smart conveyance systems, back-up mechanisms, an international convention centre, international school and colleges, and five-star hotels and restaurants. Poll-bound Gujarat is likely to see a Rs 4,650-crore redevelopment plan for Surat’s railway station. Indian Railways (IR) will be tying up with the state government and the local body to pool land belonging to all three, a first. The redeveloped station is intended as a multi-model transport hub, with train, commuter rail and bus connectivity. The project is likely to be commissioned by December 2018. “The redevelopment plan will be announced soon. We are expecting an expense of Rs 1 crore a sq ft. The money will be put in by the government,” said an official. About Rs 650 crore (Rs 6.5 billion) would be spend on station redevelopment. The other Rs 4,000 crore (Rs 40 billion) would be to develop a commercial complex connected to the multi-modal transport hub. “A joint venture for undertaking the project will be formed soon,” said the source. Earlier, the government had invited global bids for the station but got lukewarm response. For the revised project, a concept design has been made by architects C P Kukreja Associates. IR is likely to form a joint venture for this with the state government and local bodies, the area to be developed on a revenue-sharing model. Last year, a memorandum of understanding was signed between IR, Gujarat State Road Transport Corporation and Surat Municipal Corporation in this regard. The plan is for the railways to hold 63 per cent stake in the project, the state government about 34 per cent and the remaining three per cent by the local body. By the plan, the redeveloped stations will provide amenities like digital signage, escalators, self-ticketing counters, executive lounges, restaurants, malls, theatres and Wi-Fi. “This is going to change the face of Surat; we want to make it (the station) one of the largest in Asia. The 140-metre building will be the tallest in the city. A 300-room five-star hotel will be attached to it,” the official added. For the hotel, operational rights have already been given to the Leela group. Earlier, the Wanda group from China had shown interest in both Gandhinagar and Surat stations but the smaller size (around Rs 400 crore each) of the then designed projects had made it less lucrative for global majors. This was after roadshows in Abu Dhabi and Dubai. The Railway Board had reviewed its redevelopment policy after tepid responses from companies for the 23 stations put for bidding in February 2017. On an average redevelopment of a station is expected to cost Rs 400 crore (Rs 4 billion); major ones as in Delhi and Mumbai could see investment up to Rs 15,000 crore (Rs 150 billion).